Regally-bred Savabeel three-year-old The Chosen One might be on a plane to Australia next week. 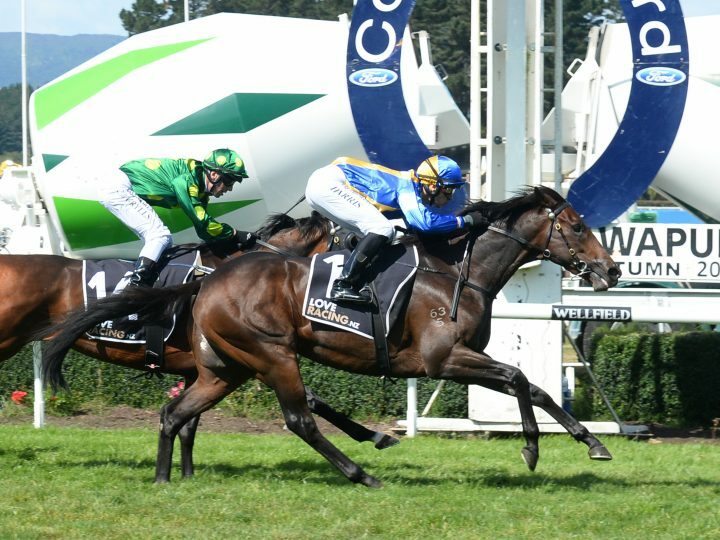 Following his impressive win in today’s Gr.3 Manawatu Classic, his connections will ponder a tilt at next weekend’s Gr.1 Australian Derby. “We will have to have a think about that,” co-trainer Murray Baker said. The Chosen One was part of a four-strong challenge on the race for the stable. “I thought they all had a show as they were fit horses and had run well with their previous form,” Baker said. The Chosen One is owned by a large group that includes his breeders Joe, Martin, Ray and Tony Dennis. He the first foal of outstanding South Island race mare, The Glitzy One, who won eight races and was stakes-placed on multiple occasions. The brothers have enjoyed an outstanding run of success with the family of The Chosen One. It includes his third dam The Jewel, an O’Reilly mare who was a two-time Group 1 winner of the New Zealand 10000 Guineas and the Waikato International Stakes.